There is no shortage of News Readers for the iPad. So many choices has driven us to start down the path of doing a overview review of the many that we use daily. Yes, we use more than one. Most share the same features with minor tweaks, with a few stepping out of the box through unique user interfaces. One that has been getting used more this last week is TapTu. 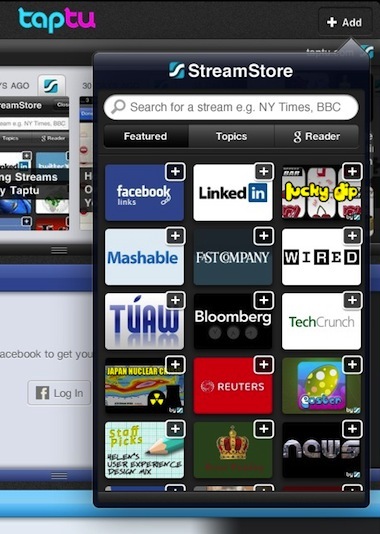 This free universal app allows users to mix news providers together so your able to look at groupings of news types rather than looking through a provider at a time. 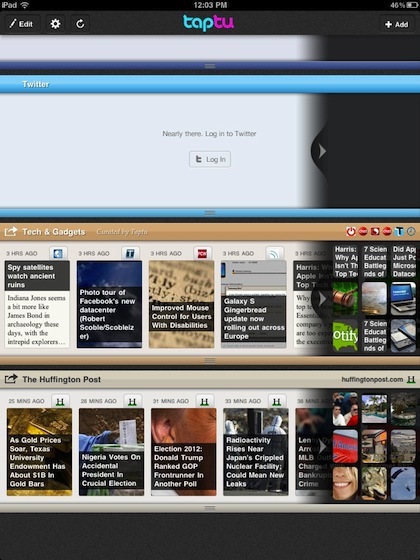 Some press has compared TapTu to FlipBoard. We don’t see that at all, it is much more like Pulse’s interface. 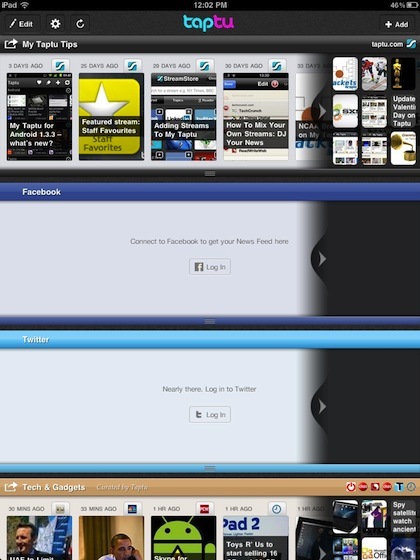 The feeds are grouped in a line from left to right that you can sweep through and tap to open/read. The streams of grouped news are arranged across the screen. You can scroll up/down to go from news stream to another. Swipe left/right to work through the news. Larger icons and short texts are the majority of the stream box, with the next group in smaller icons to the right. Across the top right corner of each Tap Tu stream is the icons of each news feed for easy reference who your pulling news from. 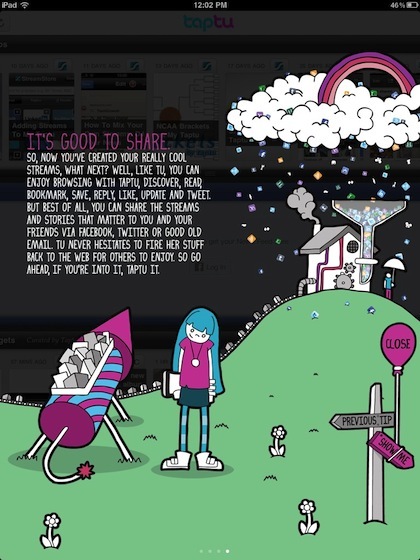 While Tap Tu offers a couple ‘streams’ pre set up to view. Tap the ‘Add’ button in the upper right corner of all news screens to gain access to quick access ‘Featured’ list of News Feeds you may want to use. Tap Tu also offers a list of popular topic areas that contain feeds within that subject area. Another tab provides access to pull news from your Google News Reader account. Each of the ‘Topic’ areas has a scrollable list of news feeds that you can select to use as well un-select later if you find it doesn’t match your expectations. 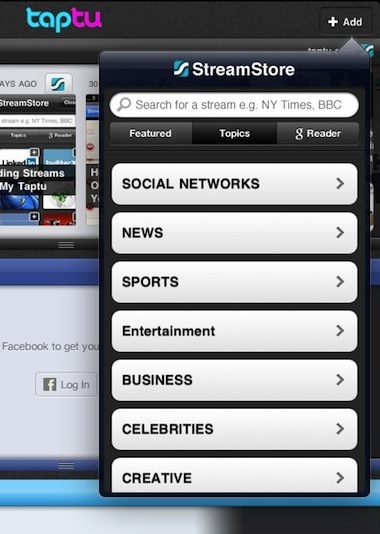 ‘Streams’ can be set up to contain a variety of news feeds. Each can be labeled and color coded for easy reference. Through the StreamStudio, you can edit current streams or create new. 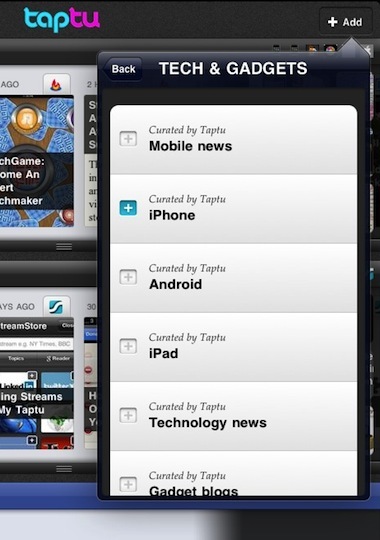 Tap Tu also allows the streams you set up to be shared with others that might share in your interests. 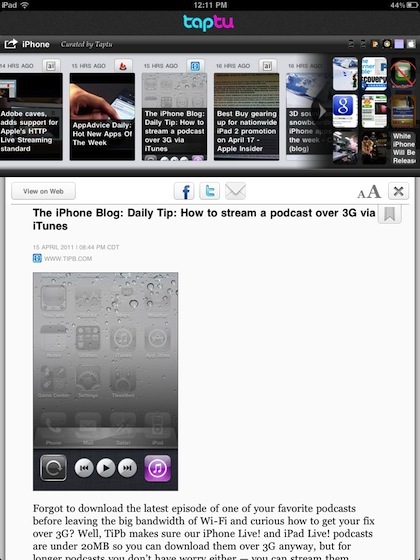 Tapping any item will result in the lower part of the screen to change to the full news article. This is a light view without content beyond the post. 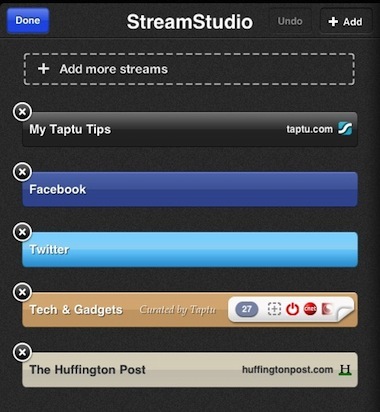 Tap Tu also offers quick access to sharing via Facebook, Twitter and eMail. Font size and bookmarking for later reading is also available at the top of all posts. Tap the ‘x’ to collapse. 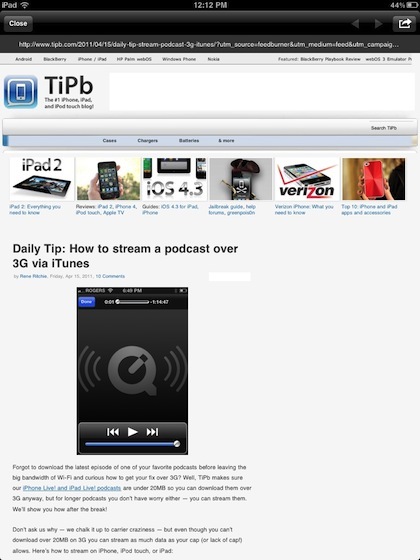 Like most ‘readers’ for the iPad, Tap Tu gives you the option to view the news item directly from the Web. Complete with all the ads and ‘other stuff’ not related to the news content. Sometimes though, this view is handy to see related items from the news provider. We are going to cover how many apps these days have zero instructions creating the need for people to tap around to figure out how to use the app. Tap Tu has fun instructions to walk through in the beginning and reference later too.